← Thinking Outside of the Salad Box. Up for hours without much to show for it. I’m at home with a sick little girl. Yes, I’ve managed to get Mrs. E. and Monkeyboy dressed, fed and off to school and the girl at least fed, but that’s it. Haven’t even had a morning cup of coffee yet, so please forgive the rather lost and vacant expression in the photo above. This seemed a suitable post for the start of the weekend, for it could involve loafing about the house. How are you attired first thing in the morning? It’s hot here in Central Virginia already 70ºF and projected to be 96ºF this afternoon. All of which explains why I am not in a dressing gown. I am, however, in my pyjamas. A Gentleman’s Wardrobe: Classic Clothes and the Modern Man , pg. 70) The 21st Century man has added a t-shirt and boxer shorts to the list, if he sleeps in anything at all. I’ve reached the point where I think it best to have a pair of pyjamas. And it is comfortable to pad about in them in the early morning hours. Consider a pair. Derek Rose makes a beautiful version. But even at Sierra Trading Post you’re going to shell out USD$160. Mine are from Target, although they’ve done away with the 100% cotton version. 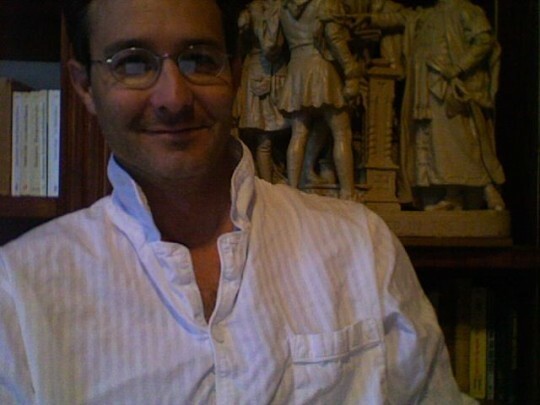 This entry was posted in Elegantology and tagged "A Gentleman's Wardrobe", Derek Rose, Elegantology, Paul Keers, Pyjamas, Sierra Trading Post, Target. Bookmark the permalink. 11 Responses to ‘ Morning. For their price, the only justification I can see for Derek Rose is that they proide something close to a sensual experience (which I doubbt) in which case, they may keep me from getting some shut-eye. 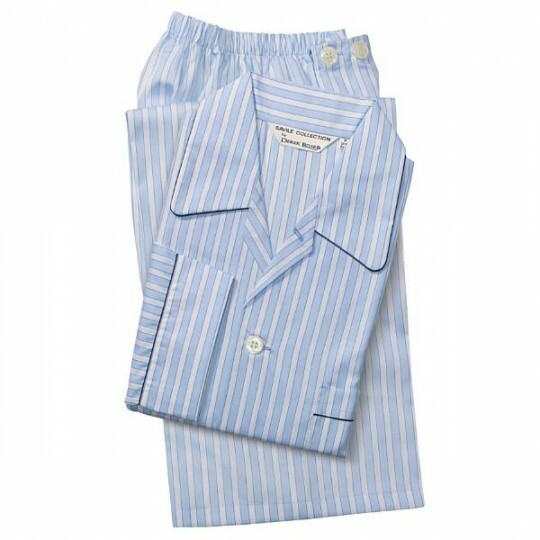 Brooks Brothers makes great, roomy, 100% cotton pajamas at far more reasonable pices and, when on sale or at clearance, can be had from $40-$60. My only issue with them is that I invariably have to get the bottoms hemmed as they run very long for my stuby 30 inch inseam. I’d say the Derek Rose are a superb acquisition that justify the price, which can be expensive but over the years will pay off; they are very comfortable, and they endure. I own several of these, the oldest is now 7 years old, in a interesting lavender color, of course it has faded in these years, but it has done it graciously and the cotton softens from the wear but still looks solid and able to serve a couple of years more. Also even thought I paid full price for most of mines I was lucky enough to find others with a large discount during summer sales in Europe. However I’m sure the ones from Brooks Brothers or Target still provides a lot of comfort and style. Hope that your little girl is back to normal asap. Go for the pj’s!! Hoping your daughter is feeling better today. Wishing I could convince my spouse to wear p.j’s. You’d think being from Scotland it would of been too cold to not, but he see’s no need for them. Men in a good pair of pajamas in so very Cary Grant! Hello All, Many thanks. The girl is back in action and now my son and I are sick! Typical. Ms. Milne, thank you for visiting and for the good wishes! You have a great blog yourself. Erick, I do have a pair of Brooks Bros., but they are a bit heavy compared to my Target issue kit which were half the cost. However, my last pair of BB’s pyjamas lasted about ten years. Good value for sharp looking sleepwear. I’ve been wearing pj’s when I get up in the morning for about three years now. I can’t sleep in them–too hot–but it’s nice to wear something loose and comfortable in the morning that, at the same time, doesn’t matter if the kids spill their cereal all over. I just couldn’t justify spending the extra money on a fancy pair–Target gets the job done. Although I did have my wife hem the legs for me. Eric, well done. I know what you mean, I often doff the top until morning. Paula, not all the time, and I can be a bit rumpled in the morning. It doesn’t bother me and there’s always the dressing gown should the need arise to be more presentable. We had the same treatment in Spain at the Alhambra Hotel. Freshly ironed underclothes and shirts — delightful. Glad to hear your kids feel better, hope you do too. I was checking the prices on the internet over the weekend and for the USA they are outrageous. I checked Derek Rose web in the UK and they retail about 70 British pounds ( more or less $110) without any discount. So I do not think I paid more than 100 Euros for my last ones that I bought at El Corte Ingles while in Spain, which without being cheap can be reasonable. Since I don’t really sleep in my top, I don’t have to iron it much–typically just the collar. But they’re pj’s. They’re supposed to look slept in. That’s pretty cool I think….